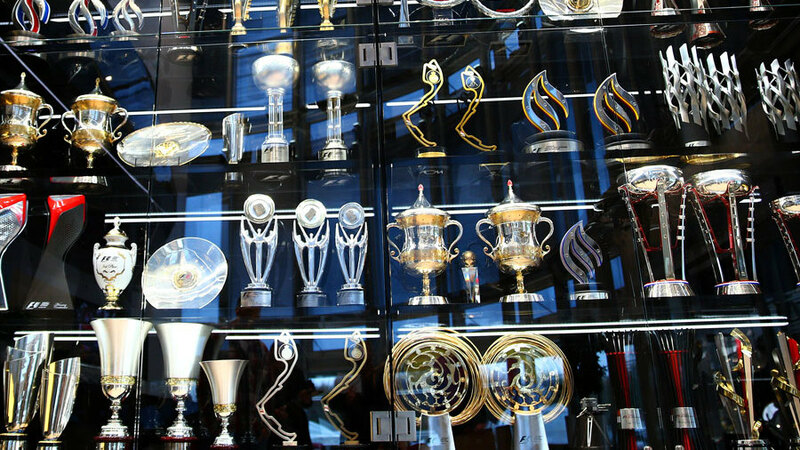 Over 60 trophies were stolen from Red Bull's factory on Friday night after a smash-and-grab break-in, in which a 4x4 was driven through the front entrance. Police were called to the Red Bull factory in Milton Keynes at 01:30 on Saturday morning after night staff, who were unharmed, reported the burglary. A silver 4x4 was driven through the entrance doors to gain access to the building and once inside a group of six men stole over 60 trophies on display in the main entrance hall. A dark blue Mercedes estate car was also used in the burglary and the police believe both vehicles have foreign number plates. "We are obviously devastated by this serious factory break in, which saw offenders drive a vehicle through our front entrance and steal more than 60 trophies which took years and hard work to accumulate," team boss Christian Horner said. "The break-in caused significant damage and was very upsetting for our night officers who were on duty at the time. The offenders took items that not only did not belong to them, but which represented the efforts of a group of dedicated, hard-working individuals. "Beyond the aggressive nature of this break-in, we are perplexed why anyone would take these trophies. The value to the team is of course extraordinarily high due to the sheer hard work and effort that went into winning each and every one. But their intrinsic value is low; they would be of little benefit to those outside of the team and, in addition to that, many of the trophies on display were replicas. "The actions of these men mean it's likely that we will have to make our site less accessible in the future, which will be unfair on the hundreds of fans that travel to visit our factory each year to see our trophies and our Formula One car. We would like to appeal to anyone who knows any information on the whereabouts of these trophies or the offenders involved to contact Thames Valley Police." A police statement added: "There is no description of the offenders available at this time, although they are all believed to be men, wearing dark clothing."